Selected bird News from Nial Moores, Bernhard Seliger, David Melville, Felix Glenk, Chong Jong-Rhyol and MOLEP. 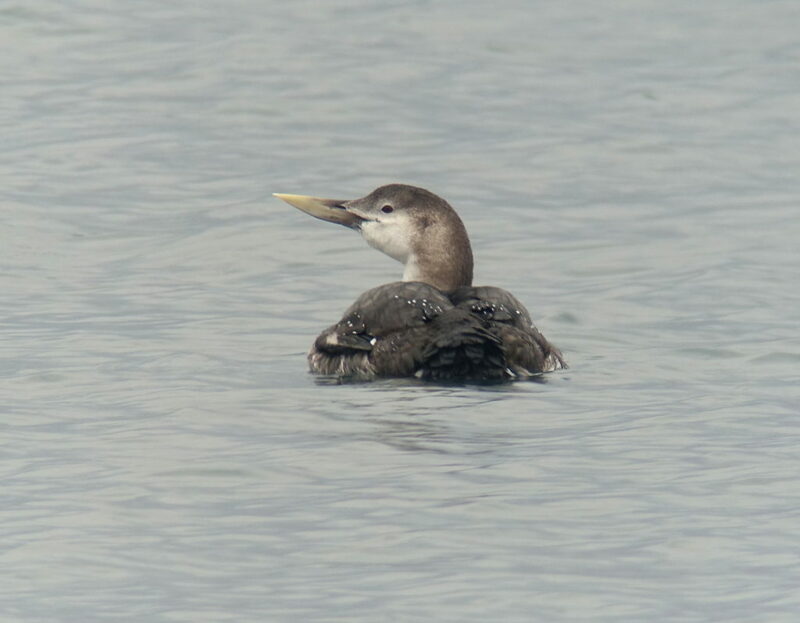 Among a total of 115 species recorded between March 3rd and 8th, birds of greatest note on the east coast included single Japanese Wagtail, 32+ Yellow-billed Loon and 1,550 Pelagic Cormorant in north Goseong and 4-5 Relict Gull in Wonsan; while on the west coast at Mundok we found 3,100-3,500 Swan Geese, single presumed Greylag Goose, two more presumed Relict Gull and 4+ Eurasian Collared Dove. 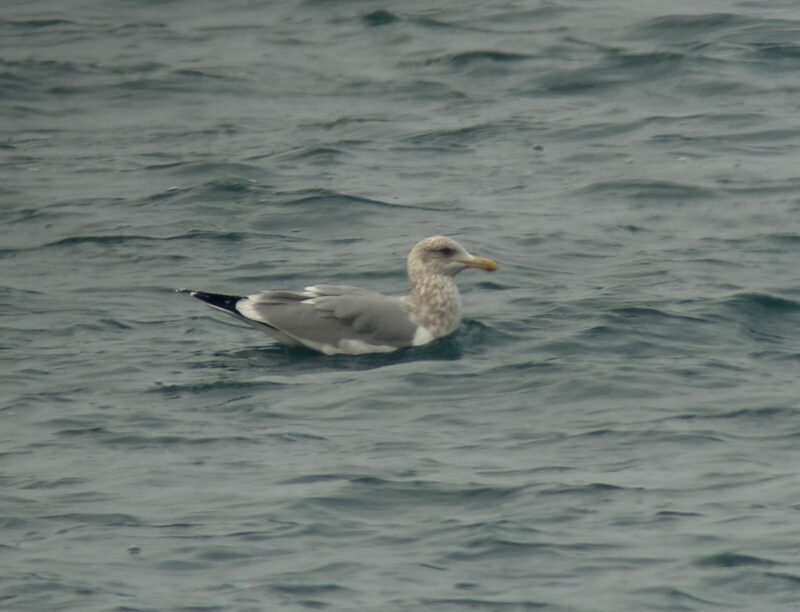 During the survey we also confirmed the presence of two species apparently unrecorded in the northern provinces of Korea (or DPRK): single Glaucous-winged Gull between Wonsan and Kosong/ Goseong on the 3rd, and Brunnich’s Murre in northern Kosong on the 5th. Swan Goose Anser cygnoides. At low tide on the 8th we counted between 3,100 and 3,200 of this Globally Vulnerable species from the hill next to the bird observatory building overlooking the mouth of the Chongchon Estuary in Mundok County. Most of these appeared to fly up river, to the east, as the tide turned, with only 700 still there at mid-tide. At high tide we then counted 2,800 on a muddy reed-island several kilometers up-river, with some of the flock likely invisible behind the reeds. As there seemed to be a strong likelihood that many of the same individuals were seen in both count areas, a conservative estimate for the day of 3,100-3,500 individuals seems reasonable. Although this number is far greater than that suggested to be present in the DPRK by Tomek (1999), available evidence (including tracked birds from Mongolia and recent counts) now suggests that perhaps almost all of the world population of this species stage in the northern provinces of Korea, with most at the mouth of the Anmok River and in the Chongchon Estuary. 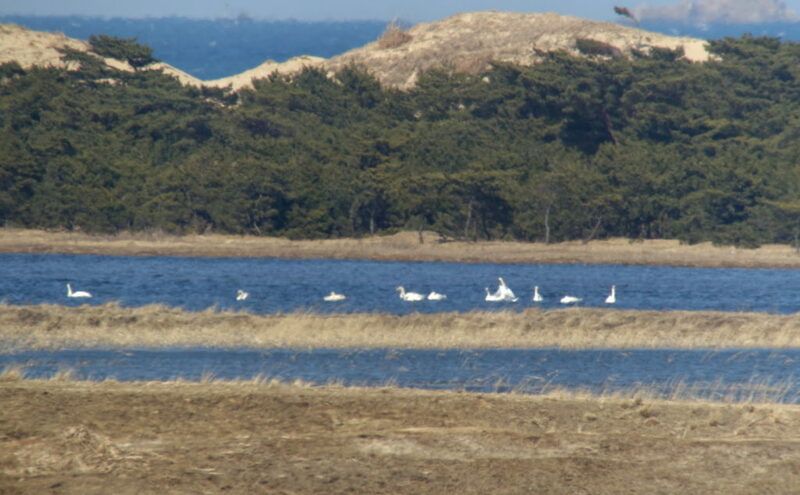 At this latter site, >30,000 Swan Goose have been counted, first by local researcher You Jae-Su and again – as recently as in November 2016 – by Nyamba Batbayar (2016). Taiga Anser fabalis and Tundra Bean Goose A. serrirostris. As Tomek (1999) only lists “Bean Goose”, it is worth noting that we observed (and photographed) both Taiga and Tundra Bean Geese at Mundok on the 8th, with an estimated 90-120 of the former and 50+ of the latter species. Greylag Goose Anser anser. One bird, considered to be this species, was seen at Mundok on the 8th. The bird was seen only in flight and only by NM at considerable range (>2km) and was identified on the basis of its large size (not too dissimilar to Swan Goose), with a pale grey plumage and paler-still forewings. Tomek (1999) could not trace any records of this species for the DPRK, but the Red Data Book of Animals (published in 2002) lists three records, including two records from the Chongchon Estuary (12 on November 13th 1990 and two on March 14th 1991). Mute Swan Cygnus olor. 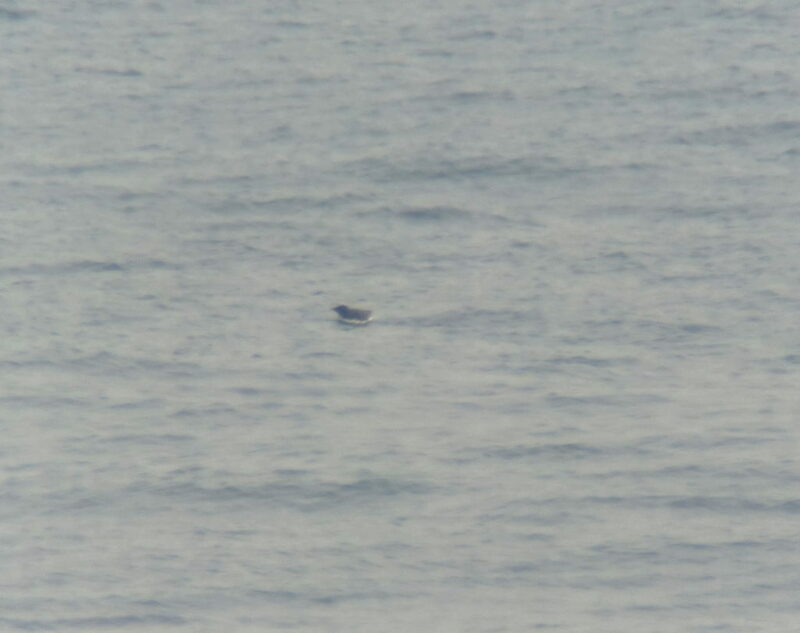 A group of 11 were seen and digiscoped at long range on a pool about 13km south of Wonsan (perhaps at 39.149, 127.608). Although Tomek (2002) traced only six records, this species is now considered to occur regularly at several east coast sites in the northern provinces (communicated by researchers during the workshop). Baikal Teal Anas formosa. Four were on Samilpo on both the 4th and 5th; and an estimated 110+ were at Mundok on the 8th. 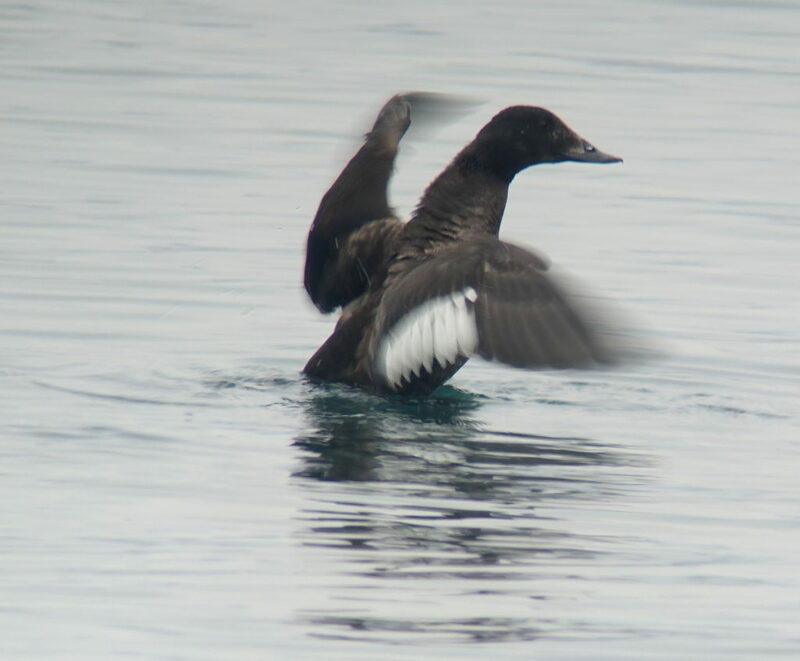 Tomek (2002) traced only 12 records for the northern provinces of Korea, though Duckworth (2006) found the species on almost 20 separate dates, including 100 at the Anju Bridge (at 39°38’N, 125°37’E) on November 12th 2003 and Arne Jensen counted 34,004 (!) in the Mundok area in November 2005. Harlequin Duck Histrionicus histrionicus. Twenty were on the sea on the 3rd off from a designated rest stop near Tongchon; 47 were visible from Haekumgang in the late afternoon of the 4th; and 43 were counted there again on the 5th, with an additional 18 counted flying north in about one hour of observation in the morning. 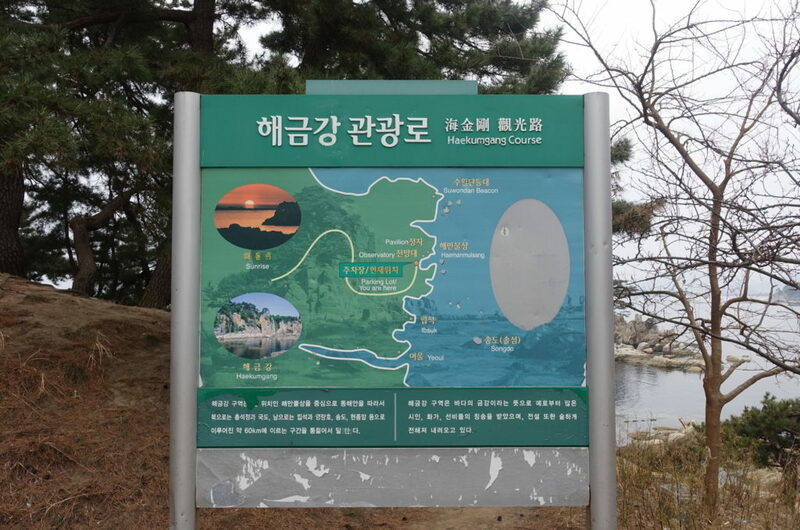 According to a researcher with the National Academy of Sciences, surveys have found a maximum of 500 along the North Kosong (Goseong) / Samilpo area coast. Asiatic White-winged Scoter Melanitta (deglandi) stejnegeri. Apparently reasonably numerous along the coast between Tongchon and North Kosong (Goseong), with ten off from the designated rest stop near Tongchon on the 3rd; two seen from the road closer to Kosong on both the 3rd and 7th; and high counts of 212 in Changjon Bay and 213 at Haekumgang on the 5th. The east coast of the northern provinces of Korea is approximately 750km long. 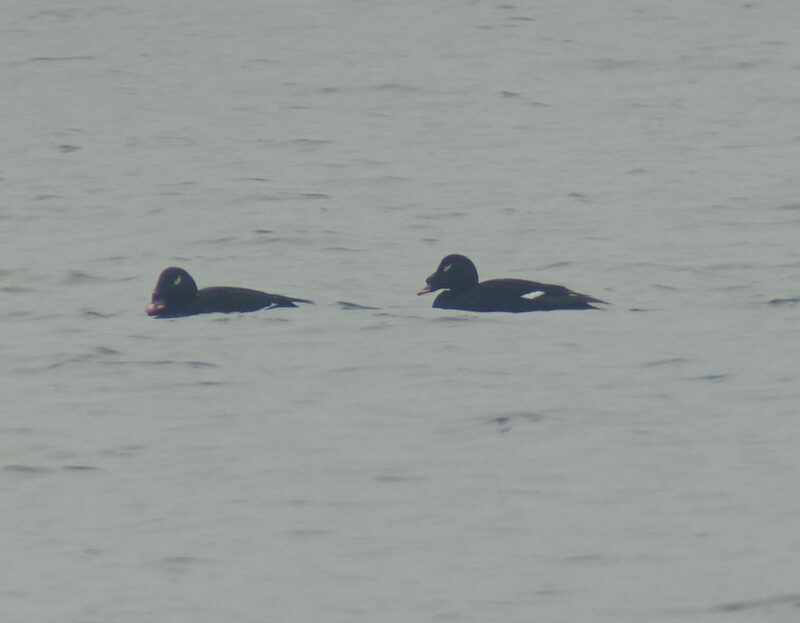 Considering the large numbers of Asiatic White-winged Scoter recorded by our surveys in Rason in the far northeast (e.g. > 4,000 there in November 2016 along <50km of coast) and these counts in the southeast, it seems likely that this coast will prove very important for this species. American Scoter Melanitta americana. Recorded in three places during the present survey: 38 from the designated rest stop near Tongchon on the 3rd; one at Haekumgang on the 5th; and 25 from the road between Tongchon and Changjon on the 7th. In combination with 200 we found in Rason in November 2016, these records contradict Tomek’s 1999 assessment of this species as a “very scarce species all over the peninsula” with only four records in the northern provinces in “the last fifty years”. Yellow-billed Loon Gavia adamsii. Between one and three of this Globally Near Threatened species were present daily in Changjon Bay on 4th-7t h and there were at least three off Haekumgang on the 4th and at least 29 there on the 5th (several of which were seen flying north close to shore). 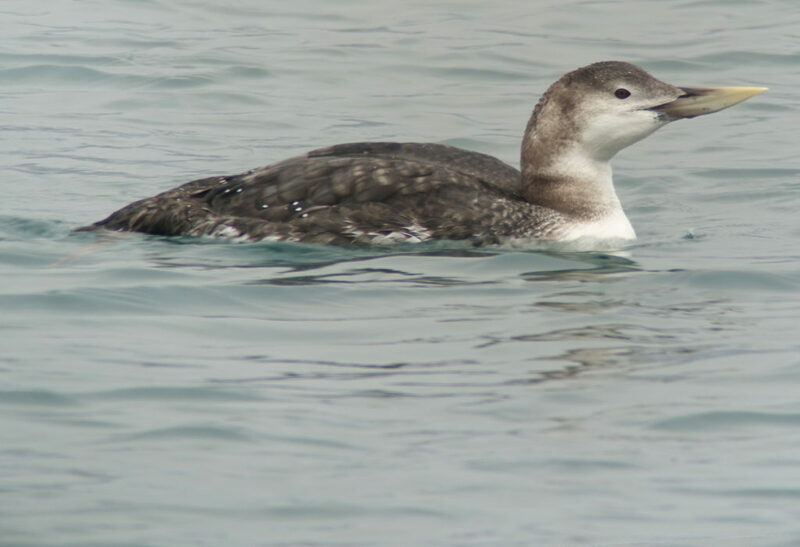 Although several Yellow-billed Loons fitted with satellite transmitters on the North Slope of Alaska were shown to winter off both the east coast, especially north of Wonsan, and the west coast, especially in Korea Bay (Schmutz 2004) and the species was also listed as a bird of the Kumgangsan area by MOLEP (2016), Tomek (1999) could trace only one record (see Duckworth 2006 for discussion) and no count of this species for the northern Goseong coast was provided to us by researchers of the State Academy of Sciences. 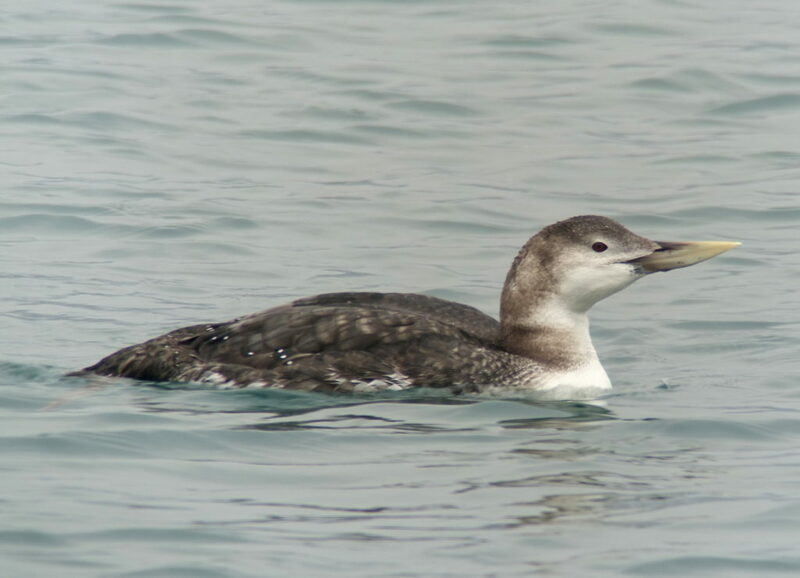 Of note, while the Yellow-billed Loon is regular in small numbers in southern Goseong (ROK) with usually 1-3 each winter, and further south along the east and offshore along the west coast, the concentration of this species recorded during this survey is much greater than any so far recorded in the ROK (even when boats are used in addition to land-based counting). Horned Grebe Podiceps auritus. 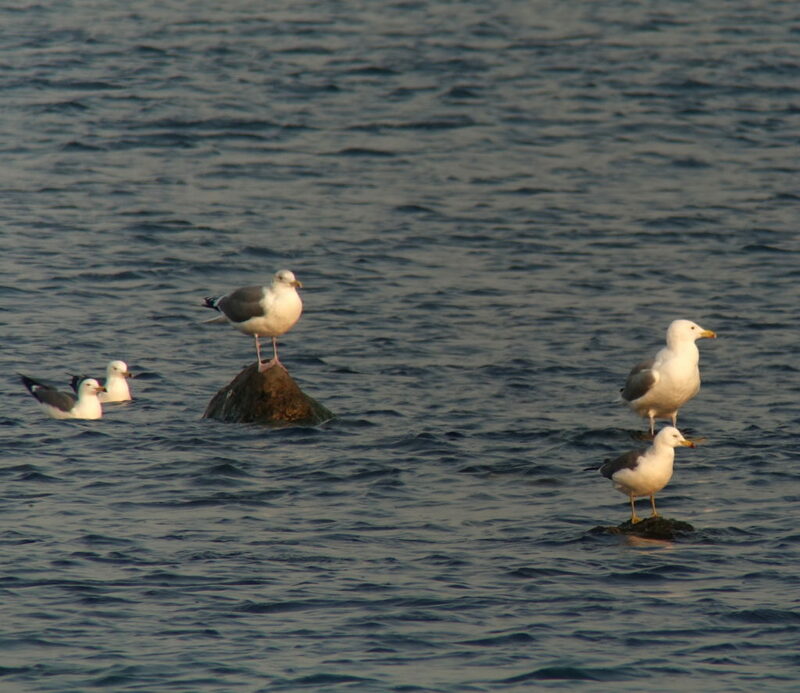 There was a peak count of five in Changjon Bay (on the 4th) and two off Haekumgang on the 5th. Tomek (1999) traced only five or so records of this recently-uplisted Globally Vulnerable species for the northern provinces of Korea. 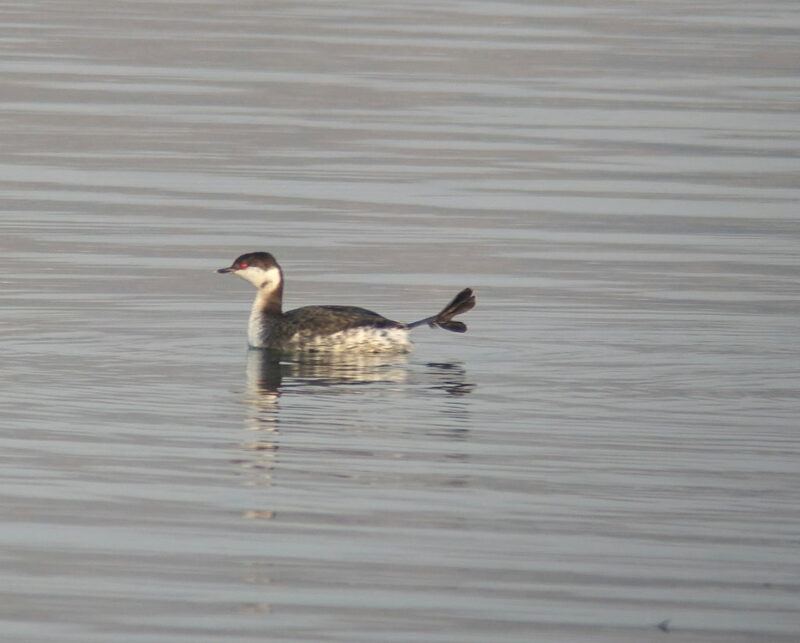 Although we recorded 40 in Rason in November 2016, our marine bird surveys and other information sources in the ROK also suggest that the species is very locally distributed – so that on present knowledge this is the least numerous and the most locally-distributed grebe species in Korea. Pelagic Cormorant Phalacrocorax pelagicus. We counted a minimum 1,550 coming from the south to roost on rocks off from Haekumgang in the late afternoon of the 4th; with only 23 there on the morning of the 5th. 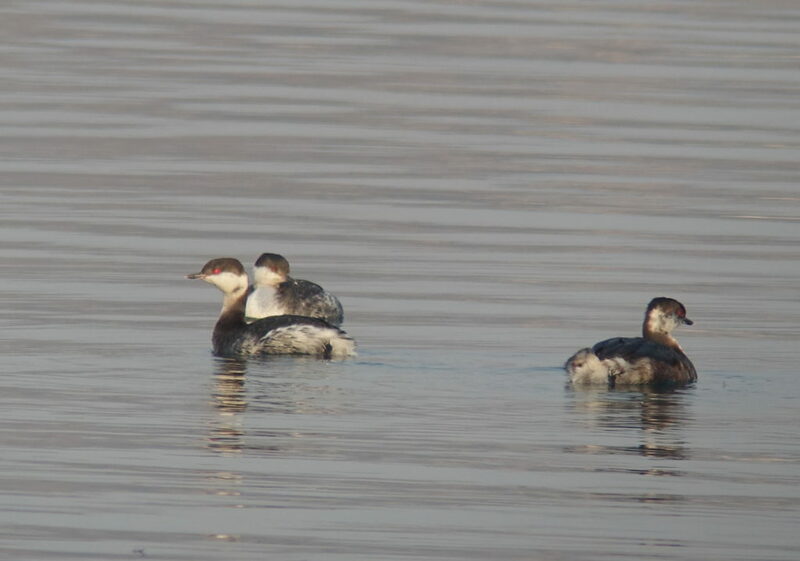 Although Tomek (1999) described this as a “rarely observed” species in the northern provinces of Korea, based on Wetlands International (2017) our high count represents 6% of this species’ total population (but closer to 1% if estimates from Russian breeding colonies are fully considered). Of additional note, researchers from the State Academy of Sciences claim that they have counted 3,000 at this site. In southern Goseong (Republic of Korea), between Daejin and Geojin, we (also) counted 3,200 in December 2016. As in previous winters, the vast majority of these were seen flying southward off from Daejin shortly after dawn. 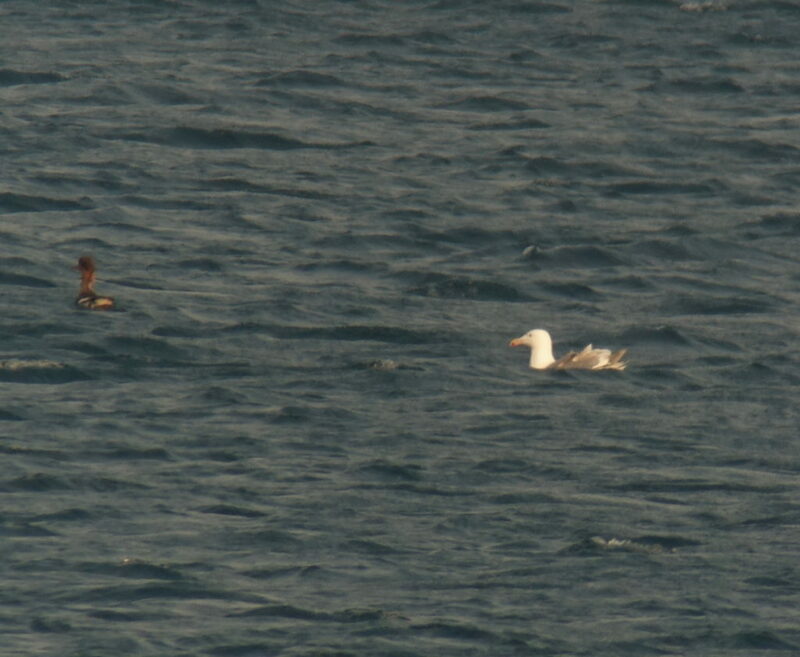 Especially considering the local distribution of this species in Korean waters (both as a breeding species and as a winter visitor), it now seems reasonable to conclude that very large numbers of this species roost overnight in northern Kosong/ Goseong and then fly south 20-25km each morning to feed in the marine waters of southern Goseong during the day, in this way commuting across the inner border area of Korea each day. Saunders’s Gull Chroicocephalus saundersi. A group of at least 50 of this Globally Vulnerable species were counted feeding (at very long range) in the other part of the Chongchon-Taeryong Estuary on the 8th, with identification based on distinctive feeding action; small size; and in one or two birds on views of the diagnostically-patterned undersides of the outer primaries. Of note, Riegen et al. (2016b) found one at Mundok and 80 at Namyang, about 20km to the south, in April 2016. Relict Gull Ichthyaetus relictus. 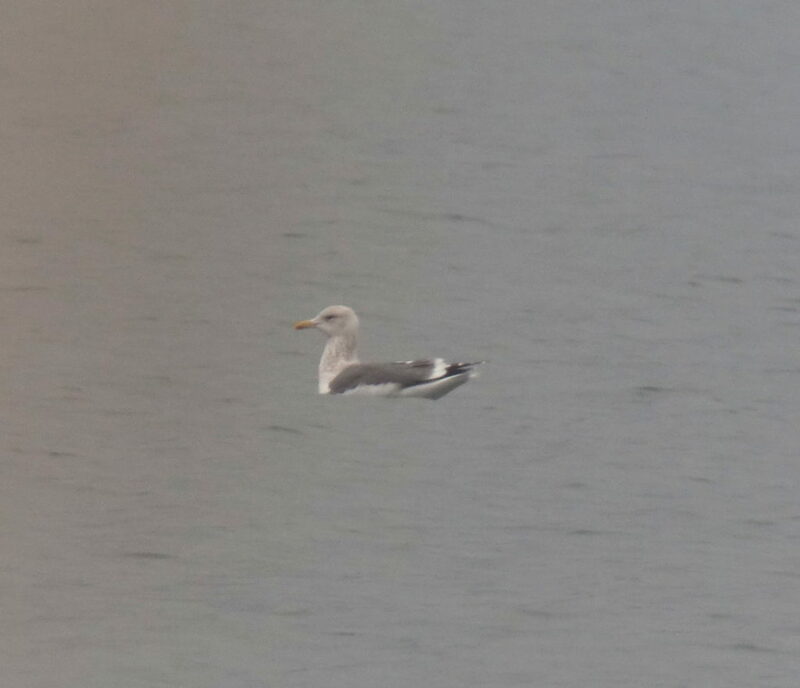 One possible was seen distantly with a small number of Common Gulls Larus canus on the beach at Wonsan on the 3rd and four or five (one Second-winter, the remainder First-winters) were seen and digiscoped at the same location but much closer and in better light on the 7th. Two presumed Relict Gulls, perhaps Second-winters or even adults, were also seen at very long range in the outer part of the Chongchon-Taeryong Estuary on the 8th – with identification made on structure, rapid walking and very pale upperparts in direct comparison with several Common and Black-tailed Gulls L. crassirostris. Tomek (1999) does not list Relict Gull for the northern provinces of Korea, and Pak Uil (verbal communication with Chong Jong-Rhyol, March 2017) stated that the species was not on the DPRK checklist. These therefore become the third and perhaps fourth records of this species – after our observations of birds (digiscoped) at Rason in both March 2014 (UNESCAP 2014) and November 2016. 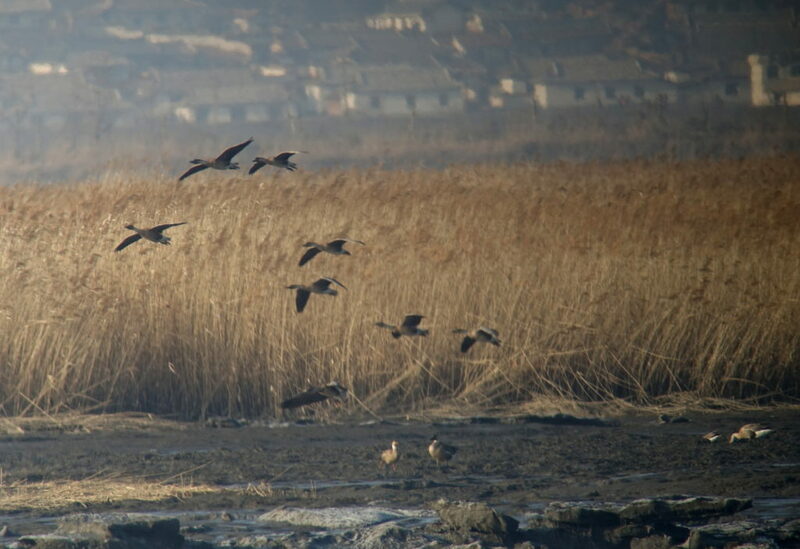 The records at Rason and Wonsan, along with the annual small wintering population at the Nakdong Estuary in the far southeast of the Korean Peninsula (<10 in recent winters), raise the possibility that suitable sites on the Korean east coast might even support internationally important concentrations of this Globally Vulnerable and highly-threatened species, the vast majority of which are now known to depend on Yellow Sea tidal-flats during the winter. Glaucous-winged Gull Larus glaucescens. An adult was poorly (but identifiably) digiscoped at the designated rest stop near Tongchon on the 3rd, with identification based on e.g. the diagnostic grey and white pattern on the upperwing in the outer primaries and on its long-billed and small-eyed look. This species is not listed for the northern provinces of Korea by Tomek (1999) and Pak Uil (verbal communication with Chong Jong-Rhyol, March 2017) stated that the species was not on the DPRK checklist. Although a researcher from the State Academy of Sciences told us that there was an earlier record from somewhere in the northern provinces, this apparently becomes the first properly documented record of this species. Occurrence of this species in the northern provinces is to be expected, however, as the species is now known to winter in small numbers along the east coast of the Republic of Korea. “Large white-headed gulls”. 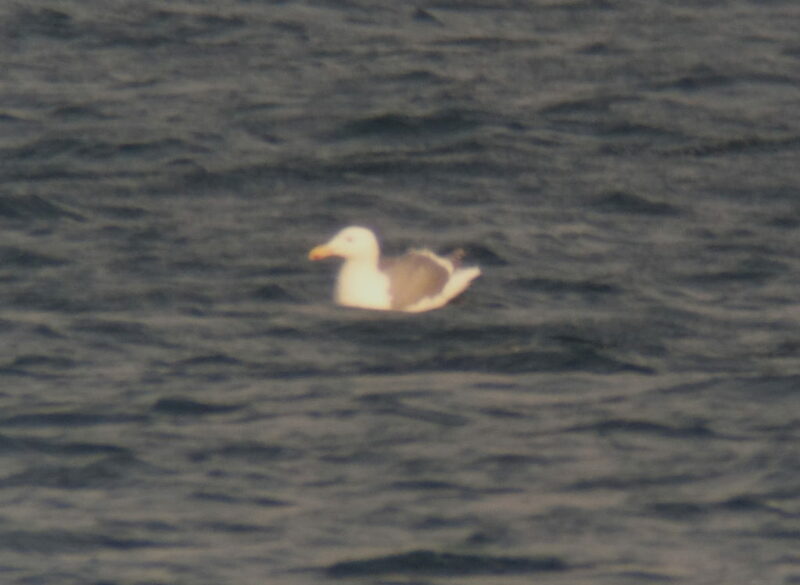 During the present survey, in addition to Slaty-backed Gulls Larus schistisagus (multiple observations on the east coast; one adult at Mundok), we recorded (and digiscoped/ photographed): Mongolian Gull Larus mongolicus in Pyongyang, in small numbers along the east coast, and a conservative 70 at Mundok; Vega Gull Larus vegae at several stops along the east coast, with high counts of 118 in Changjon Bay and 150+ on the sea along the road between Chongchon and Tongchon, and at least one at Mundok on the 8th; and Taimyr Gull Larus (heuglini) taimyrensis, with up to three daily in Changjon Bay. 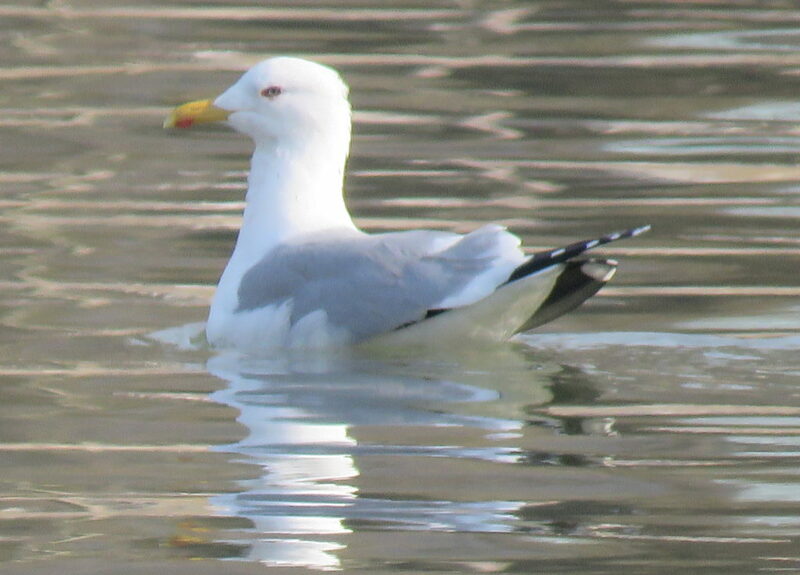 Tomek (1999) only lists Herring Gull Larus argentatus which in recent years is often used to describe a species confined to western Europe, but was previously considered to be the ‘parent’ of a taxonomically complex – and still debated – group of large gulls found across Eurasia and North America in recent decades divided by some authorities into several species. 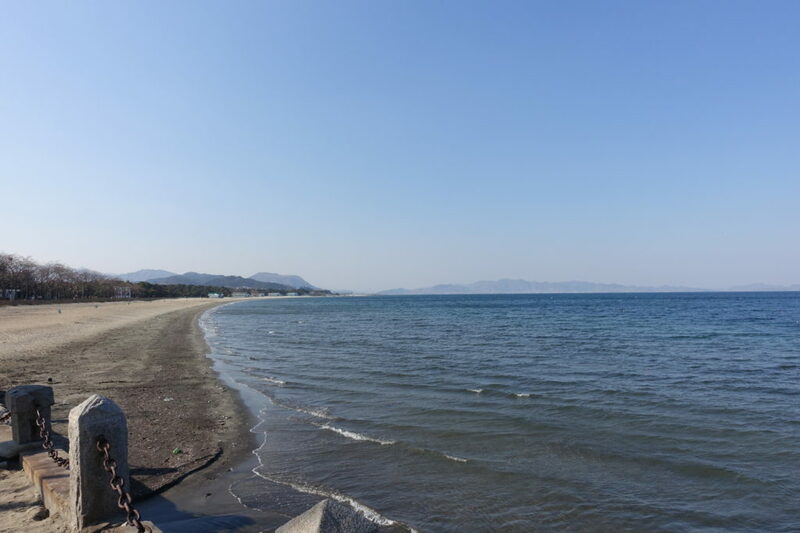 Research into gulls from this complex in East Asia remains limited or largely unpublished. 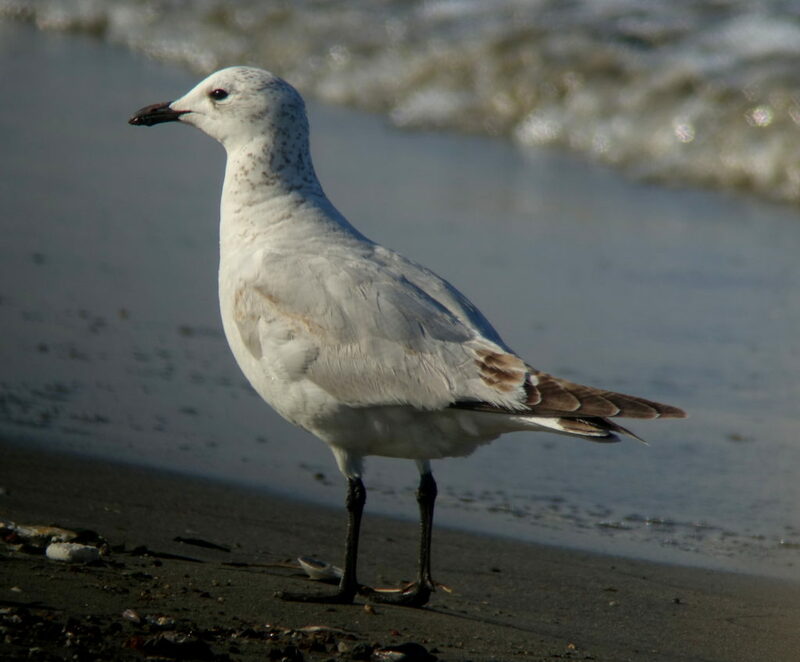 While mongolicus, vegae and taimyrensis appear to be regular in the northern provinces of Korea (as they are in the Republic of Korea), a researcher from the State Academy of Sciences told us that he had, before the present survey, considered all such Vega-Mongolian-Taimyr gulls to be Mongolian Gull. Caspian Gull Larus cachinnans. One bulky-looking (male?) 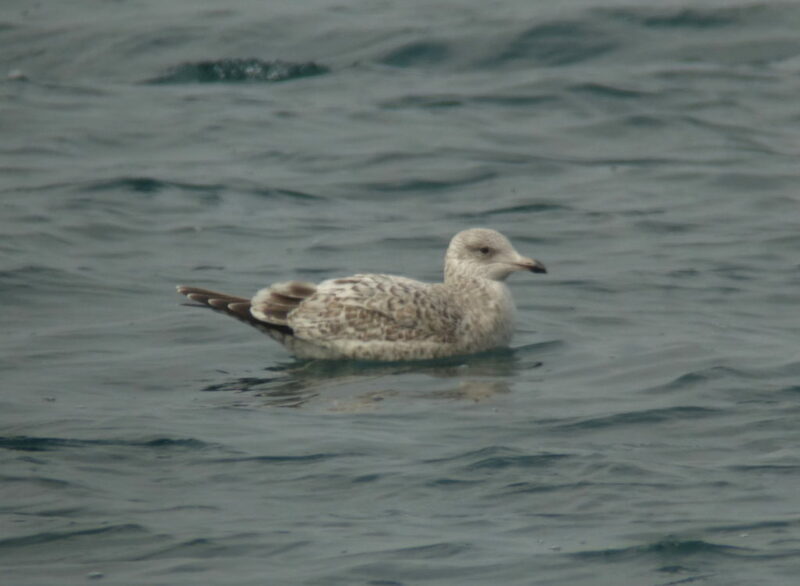 Caspian-type Gull was poorly digiscoped at the designated rest stop near Tongchon on the 3rd. Identification, although not conclusive, was based on the bird’s long bill, long, shallowly-sloping forehead and small eye (looking dark at range, but in fact clear); the grey-pink tone to the thinnish looking legs; the lack of head streaking; the complex bill pattern; and the shade of upperpart grey, which appeared to be one or two shades of grey paler than a Vega Gull standing close by at the same angle. Unsurprisingly, considering the current status of knowledge of large gulls, Tomek (1999) lists no records of this species for the northern provinces of Korea. Thick-billed (Brunnich’s) Murre Uria lomvia. 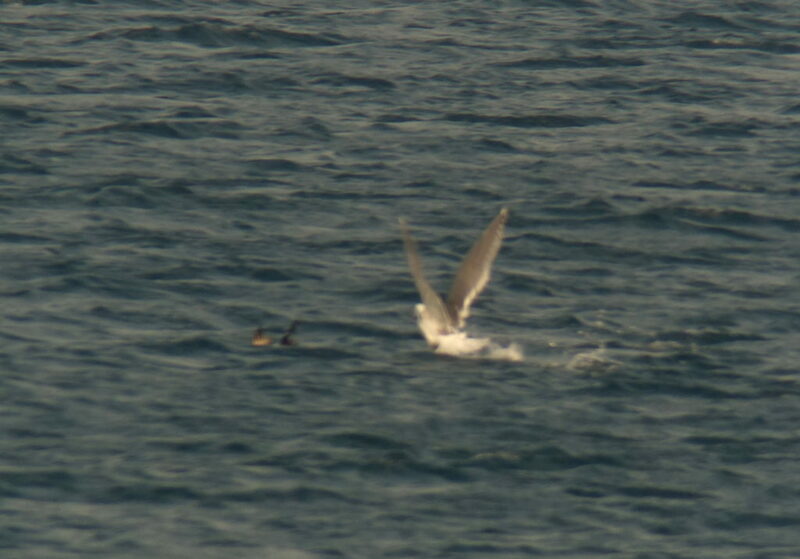 One in non-breeding plumage was poorly digiscoped on the sea at Haekumgang on the 5th. 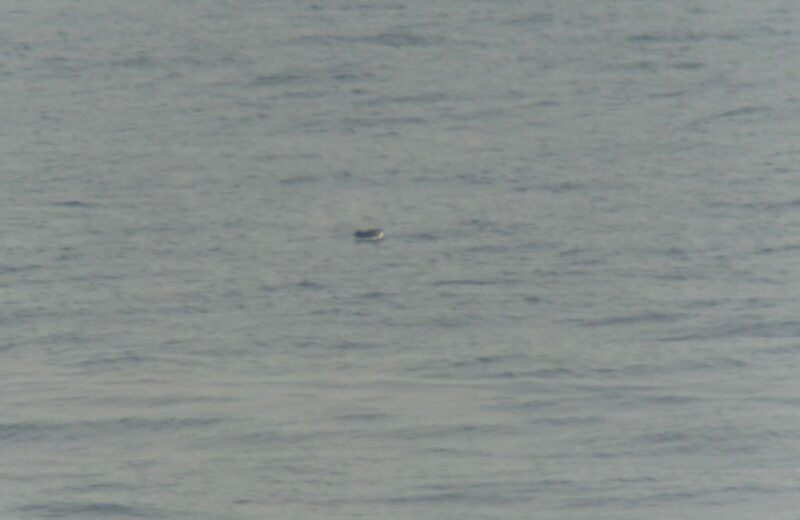 Identification was based on: blocky, large-looking head; white line on the bill (glimpsed several times); white “secondary skirt” (further ruling out transitional plumaged Spectacled Guillemot); pale throat but dark head; and lack of dark flank streaks. Tomek (1999) does not list this species for the northern provinces of Korea, and this is considered to be the first record. Brunnich’s Murre was first-recorded in the Republic of Korea as recently as the mid-2000s; but is now know to winter regularly in small numbers (c. 5-60 seen each winter) along the east coast south to the Guryongpo Peninsula, with the vast majority of records from southern Goseong County. Spectacled Guillemot Cepphus carbo. Fifteen were seen off Haekumgang on the 4th and at least 56 were counted there in better conditions on the 5th, with multiple breeding-plumaged pairs undertaking chase flights. As Tomek (1999) lists several summer-time records for northern Gangwon Province and del Hoyo et al. (1996) considered that elsewhere most individuals are resident and mostly sedentary, remaining in the vicinity of the colonies except in the north of their range, the high number and their behaviour found during this present survey suggests local breeding. More research is required, here and elsewhere along the east coast. 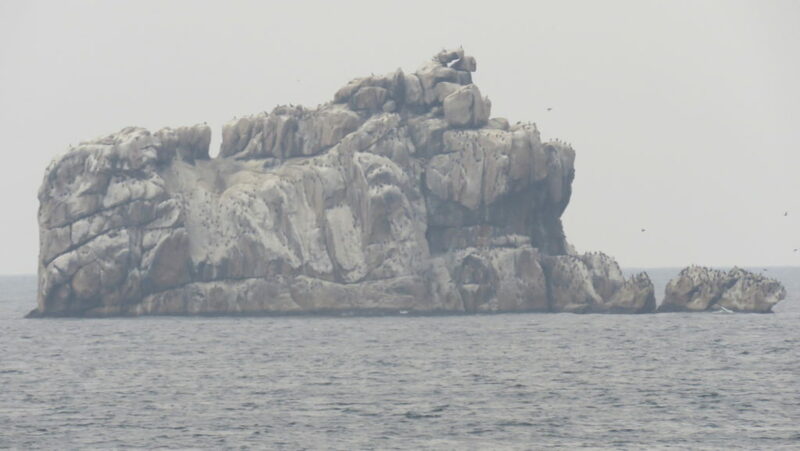 If the species does breed in northern Goseong, this would be the southernmost colony anywhere in this species’ global range; it would also seem a likely source for records of this species in the ROK – with almost all such records to date coming from southern Goseong in the winter months. Long-billed Murrelet Brachyramphus perdix. One was seen off Haekumgang on the 4th. 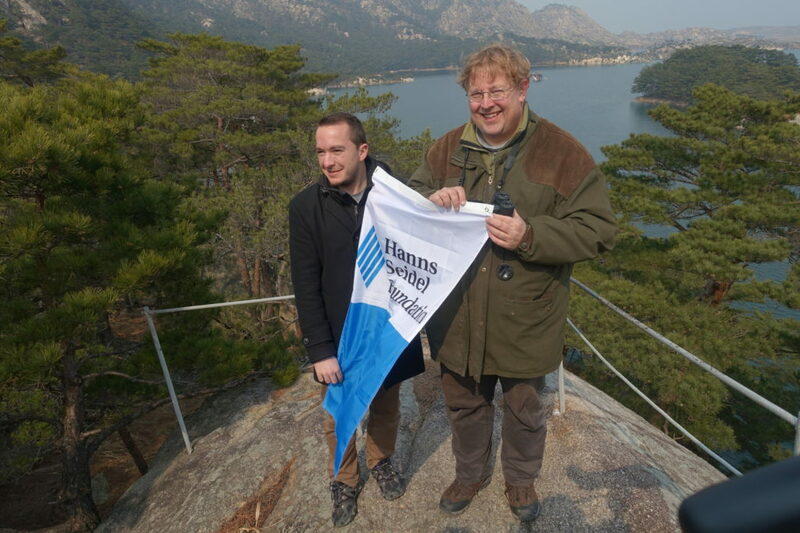 Tomek (1999) traced only two records of this Globally Near Threatened species in the northern provinces of Korea, with Duckworth (2006) adding one additional record (a bird that was photographed). Hill Pigeon Columba rupestris. Two, followed by a flock of 10-15, were seen between Pyongyang and Wonsan on the 3rd. 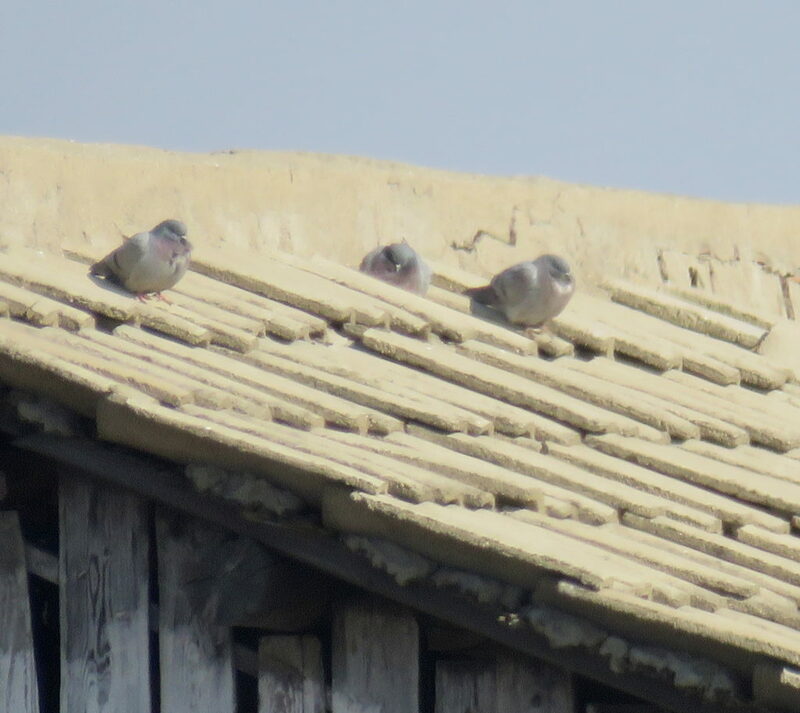 On the 8th, two were seen between Pyongyang and Mundok in the morning, with a group of ~15 seen flying under a road bridge in the evening along the same road, and a total of 18 seen in Mundok(with some also photographed). Our observations accord well with Tomek (1999) who described the species as a widespread resident. It therefore seems all the more remarkable that this species is currently the focus of a restoration project in the Republic of Korea, as the wild population has probably fallen to below 10 individuals. Eurasian Collared Dove Streptopelia decaocto. Three probables were seen from the moving vehicle in Wonsan on the 3rd; one was watched and photographed vocalising in Mundok on the 8th, where there also sightings of a group of four and two more probables. Tomek (1999) stated that this species is “rarely observed” in the DPRK, with most of the 11 records to that time coming from the north-west between May and August. She also includes one historical record from near Wonsan. 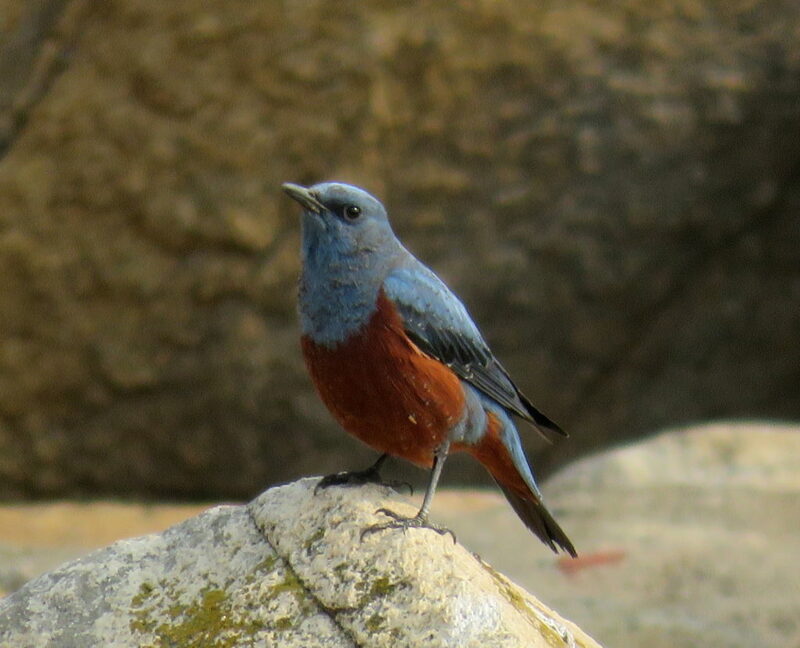 This species was Grey-Listed by Birds Korea (Moores et al. 2014), i.e. the species has effectively been extirpated from the ROK. 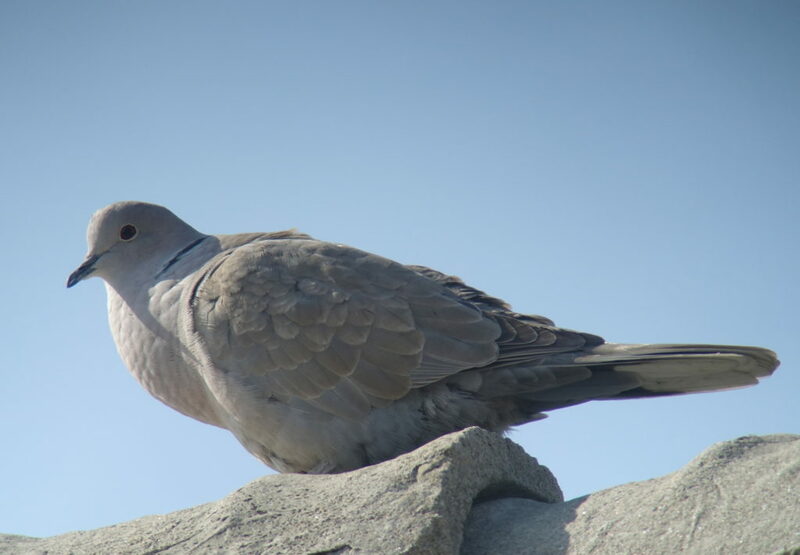 Once regular in winter, the Eurasian Collared Dove is currently scarcely recorded annually here if at all some years. Carrion Crow Corvus corone orientalis. Although we observed Daurian Jackdaw Coloeus dauuricus (once at Samilpo and once at Mundok) and c. 110 Rook Corvus frugilegus at Mundok on the 8th, and also encountered Large-billed Crow Corvus macrorhynchos multiple times, we did not record any Carrion Crow during this visit. As with our previous four surveys, we have therefore still found no evidence to support the assertion by Tomek (2002) that this is an “Abundant breeding species. Frequent and numerous throughout the entire country”, including in Pyongyang. Either the species was previously often misidentified (as in the southern provinces) or the Carrion Crow has undergone a recent and remarkable decline, at least in parts of the northern provinces of Korea. Chinese Nuthatch Sitta villosa. At least three were heard in pine forest surrounding Samilpo on the 4th. Japanese Wagtail Motacilla grandis. One was heard (by NM and BS) giving the diagnostic and highly distinctive “Dzink” call over Samilpo on the 5th, with this call repeated five or more times as the bird arrived from the southeast and flew northwest. Due to local sensitivities it was not possible to make a proper search for this bird along nearby streams – several of which looked highly suitable for the species. Pak Uil (verbal communication with Chong Jong-Rhyol, March 2017) stated that the species was not on the DPRK checklist. However, Tomek (2002) traced no less than five records, all from northern Kangwon/ Gangwon Province, all since 1980, with the most recent one noted by Fiebig in 1989. Japanese Wagtail is currently a locally common breeder in Gangwon, including in southern Goseong county north to within 25km of this record. Pine Bunting Emberiza leucocephalos. On the 3rd, a group of 20 large, long-tailed buntings, many with striking dark and white head patterns were seen from the car next to the road close to Pyongyang, about 180 km west of Wonsan. The most reasonable identification is as Pine Bunting. 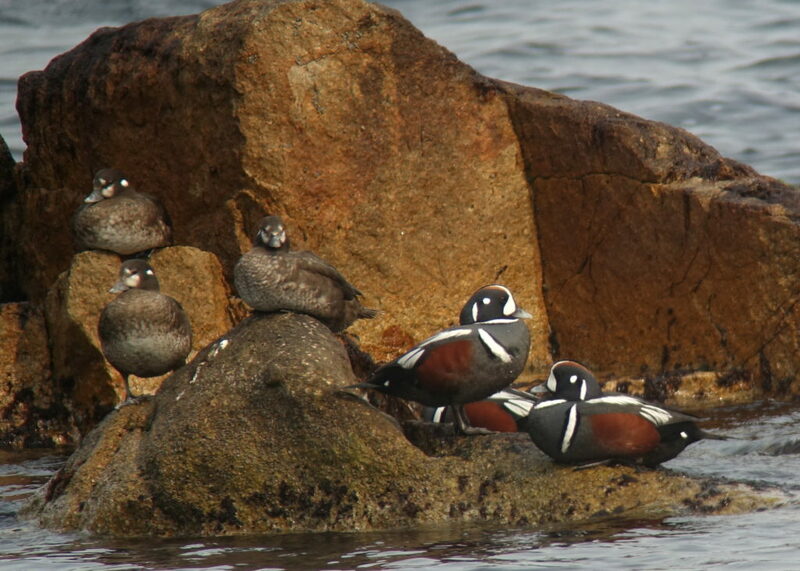 Although considered to be a rare migrant to the northern provinces of Korea by Tomek (2002), Duckworth (2006) found the species 3-5 times; and the species is now known in the ROK to be regular during migration and to occur occasionally in flocks in mid and late winter (e.g. NM counted 140 in one flock in southern Cheorwon County in January 2017). Rustic Bunting Emberiza rustica. 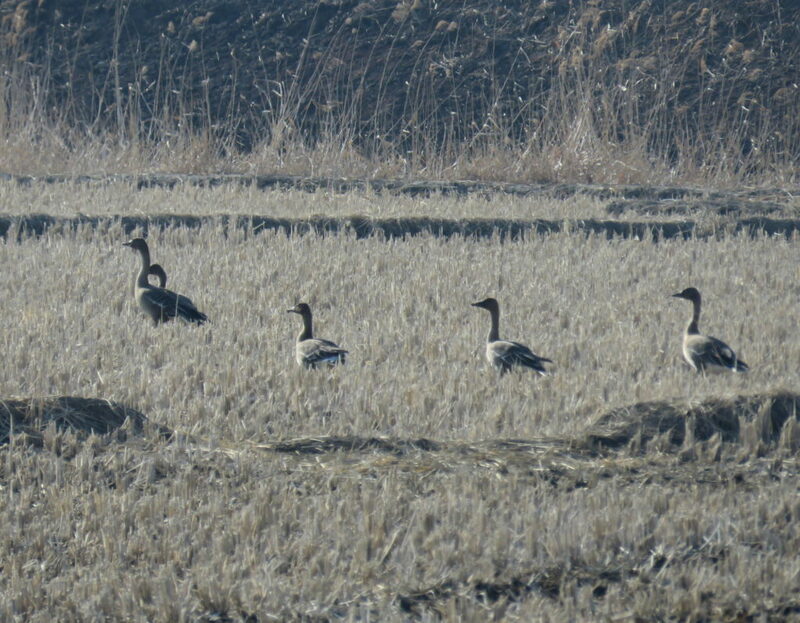 Recently uplisted to Globally Vulnerable (BirdLife 2017), several tight flocks of birds seen next to the roadside between Pyongyang and Wonsan might have been this species, including one flock of 50+ on the 7th. On the 8th, a flock of 200 or so birds seen from the moving vehicle between Pyongyang and Mundok also appeared to be this species; and probably 250+ were seen in and around Mundok itself – including one group of 20 that appeared to be the target for a bird trapper using mist-nets. Funded by the Hanns Seidel Foundation (Korea office) and supported by the Ministry of Land and Environment Protection with the full knowledge and support of the Ramsar Secretariat, this survey was conducted as part of strictly non-political work that included 1.5 days of workshops on wetland inventory and on filling out Ramsar-information sheets. 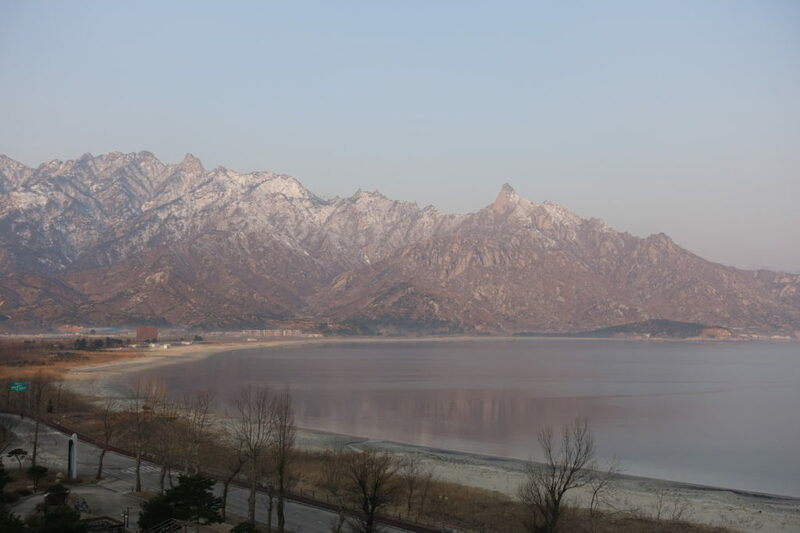 All aim to support the DPRK in their proposed accession to the Ramsar Convention, and in the designation of two Ramsar sites as part of this process: Samilpo and adjacent habitats in northern Gangwon Province and Mundok/ Chongchon Estuary in South Pyongan Province. 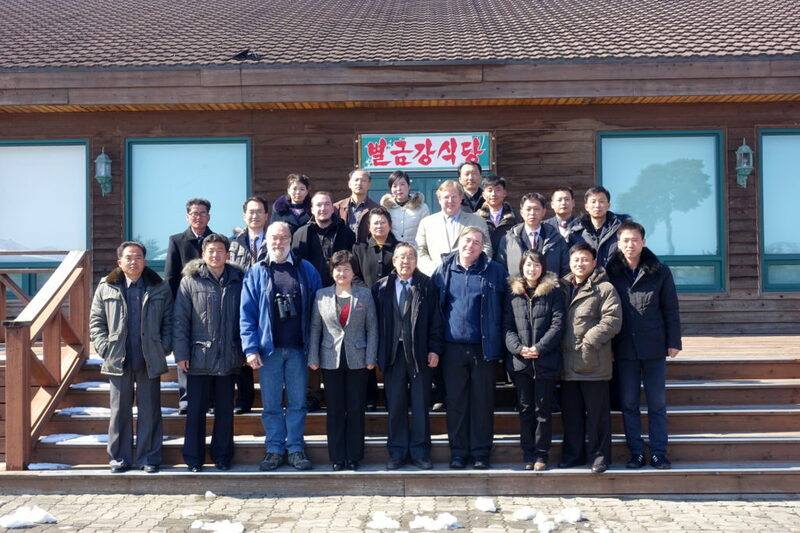 Participants of the second Samilpo Ramsar Workshop (the first was in September 2016), with among other distinguished participants from the State Academy of Sciences and local government, Mr Felix Glenk and Dr Bernhard Seliger of the Hanns Seidel Foundation (Korea office) in the second row, and Mr David Meliville, Director-General Ri (MOLEP), Professor Chong Jong-Rhyol (Chosen University, Tokyo), Dr Nial Moores (Birds Korea) and Ms Bang (MOLEP) in the front row. (All marine counts and all images by Nial Moores made – as before – with a truly superb Swarovski ‘scope…). BirdLife International. 2017. Species factsheet: Emberiza rustica. Downloaded from http://www.birdlife.org on 12/03/2017. Nyamba Batbayar, 2016. Report: Notes on daily activities on trip to the Taedong and Chongchon River Estuaries in DPRK between 5th Dec and 12th Dec 2016. For the WSCC of Mongolia. Moores, N., Kim, A. & Kim R. 2014. Status of Birds, 2014. Birds Korea report on Bird Population Trends and Conservation Status in the Republic of Korea, September 2014. Riegen, A., Melville, D., Woodley, K., Ju S-I, Kim S-H., Pak S-I. & Pak U. 2016a. Shorebird survey of the Onchon County Coast of the Democratic People’s Republic of Korea May 2015. Stilt 68: 40-45. Riegen, A., Melville. D., Woodley, K., Postill, B., Ju S-I, Hong H-S., Kim S-H. & Pak U. 2016b. 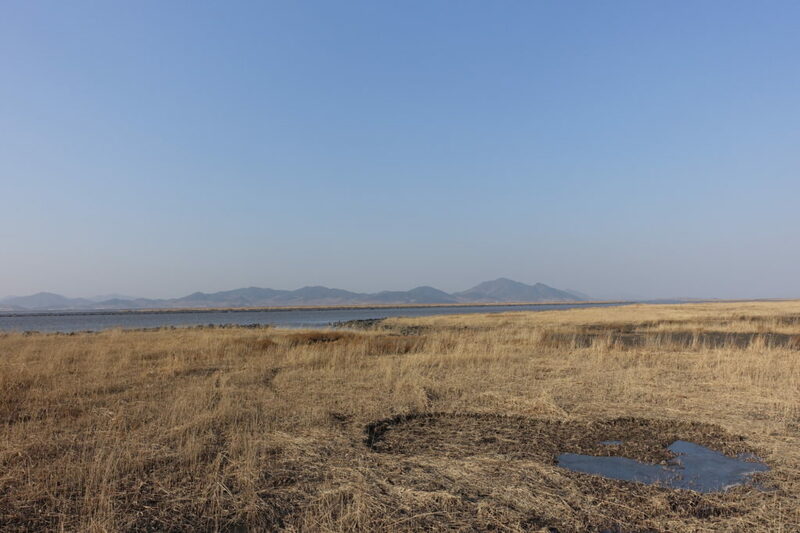 Coastal shorebird survey in the provinces of North and South Pongyan, the Democratic People’s Republic of Korea, April 2016. Stilt 69-70: 37:43. Schmutz, J. 2004. Yellow-billed and Red-throated Loon Migration in the East Asia Flyway. Summary for US-Japan Migratory Bird Conservation Meeting, Captain Cook Hotel, October 30, 2004. Tomek, T. 1999-2002. The birds of North Korea. Acta Zoologica Cracoviensia 42: 1-217; 45:1-235 (in English). UNESCAP & Hanns Seidel Foundation. 2014. Rason Migratory Bird Reserve: Birds and Habitats. Published in Seoul, Korea. Wetlands International. 2017. “Waterbird Population Estimates”. Retrieved from wpe.wetlands.org on Sunday 12 Mar 2017.